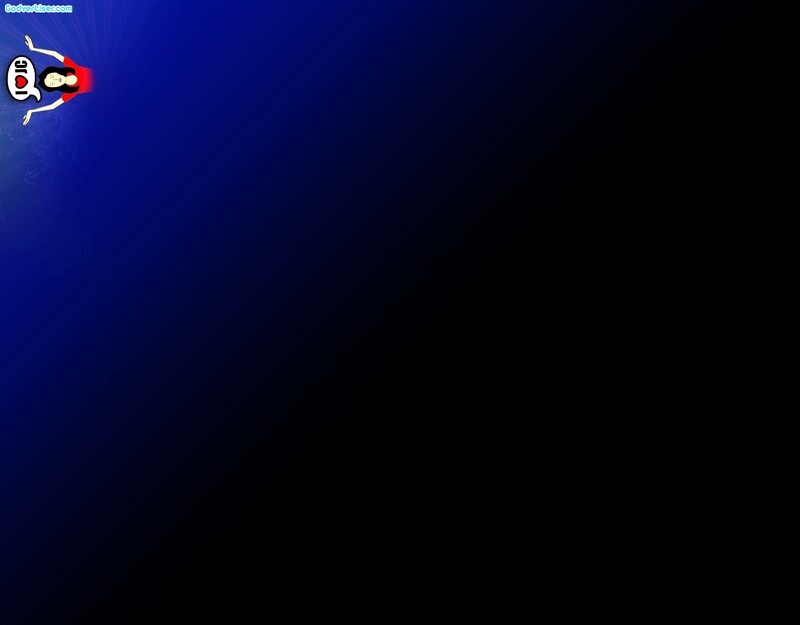 It’s been awhile since we posted a freebie twitter background. . .since Valentine’s Day. If you’ve been on Twitter for a bit, you’re background probably hasn’t been changed recently. Here’s your chance to throw up a fresh look for your Twitter backgdrop. Just download the free Tweetback image and follow the instructions below to install it on your profile. If you don’t like this one, there’s plenty of other free Christian Twitter Backgrounds available in our Twitteratti Tuesday Series. . . QUESTION: HAVE YOU CHANGED YOUR TWITTER BACKGROUND MORE THAN ONCE IN THE PAST YEAR? Valentine’s Day is upon us which is when you have the opportunity to display your LOVE. 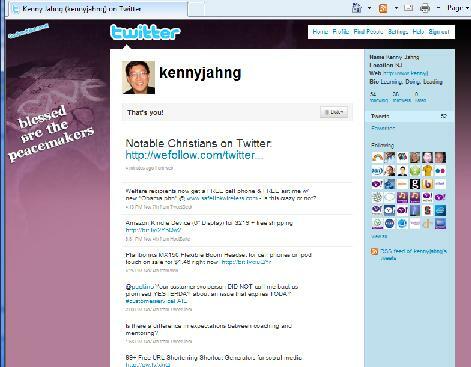 Here’s one way to share your love of God, love of others and love of Twitter all in one place — your Twitter background. Go ahead, follow the instructions below to get the latest free Twitter background with a valentine theme here at Godvertiser.com’s Free Christian Twitter Background Series. If you end up using one of our free Christian Twitter backdrops, make sure to leave a link to your Twitter profile and share it with us! 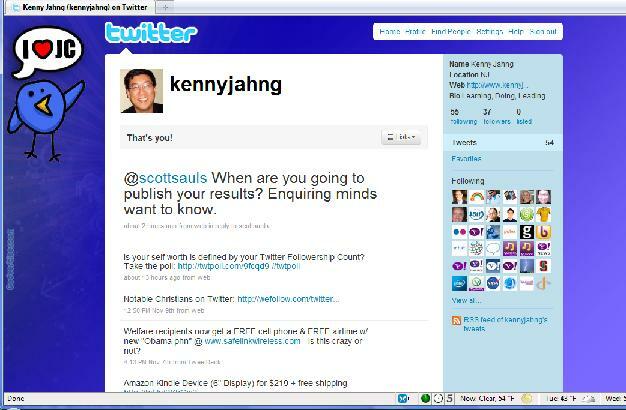 Twitter offers 12 free background templates which you can use to customize your Twitter page. It’s a good idea, although the actual options Twitter gives are not the best way to go. Why is it a good idea? Well, for starters, it legitimizes your Twitter profile. 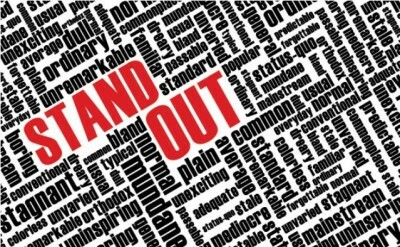 By installing an individualized Twitter background graphic, it signals creativity and leadership. It shows you are familiar with the environment. You are choosing to express your own identity, not letting Twitter define your identity. When you use a custom Twitter background graphic, you also have the opportunity to show specific facets of your identity. Here is your chance to witness to the world of your faith. Every Tuesday, we’ve been releasing a free background design for you to download and use with your own Twitter profiles. Some are explicitly Christian, others with subtle themes, and still others with Bible anchor verses integrated into it. 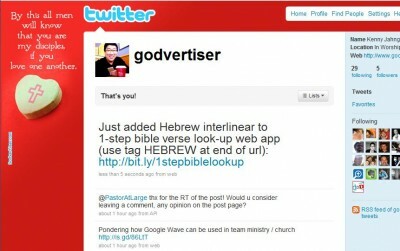 Twitteratti Tuesdays at Godvertiser.com wants you to have a Twitter Facelift today. This week’s design comes from Dave Ingland from the “left coast” who is currently planting a church in Sacramento, CA. He’s a husband, father, activist, agent for change, advocate for the arts, and lead revolutionary of Revolution Church Sacramento. You’ll find that this Twitter background is different than most — it plays with the ability to use images with transparency. 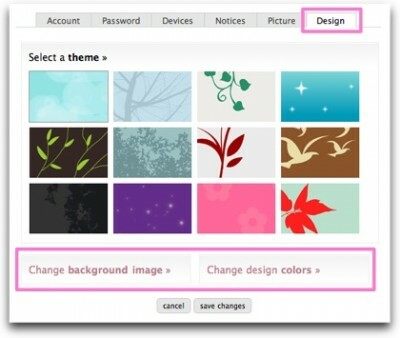 So after you upload this background design, you can set the page’s background color to your liking by clicking on the CHANGE DESIGN COLORS link in the design settings section. You’ll see that I chose a nice deep red for my background. You can make it yellow or blue or green or anything else you want! Thanks Dave for such a neat little feature. CHANGE DESIGN COLORS next on this same settings page if you want to adjust the page background colors. Tuesdays are fundays here at Godvertiser.com. We’re releasing yet another free Christian Twitter background design for you to grab and use. It’s part of our weekly Twitteratti Tuesday series helping to share a little digital Gospel across the Twitterverse. We’ve had a request for Christmas themed versions, so they’ll be coming up soon. 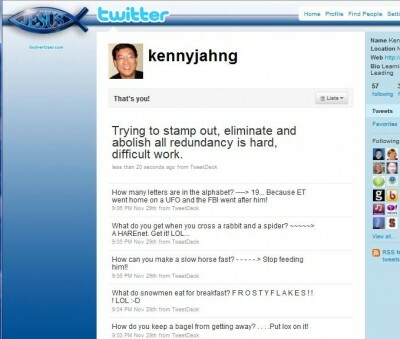 But in the meantime, check out this neat-o Christian Twitter design. We find the sign of the fish everywhere, magnets, bumper stickers, etc. 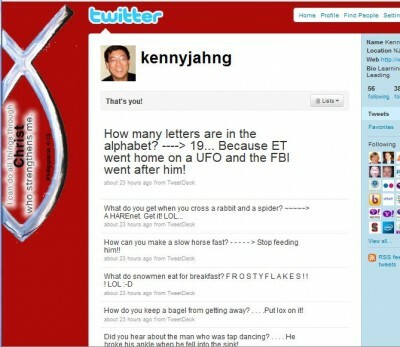 Now you post the Sign of the Twish on your profile page. Your Message Is Certainly Interesting. Too Bad No One Ever Reads Your Boring Looking Flyers. 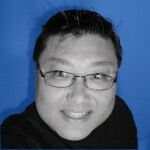 People connect visually before they consume the content they are presented. If it is engaging even before they come into focus with the words on the page, you have a higher chance of gaining and keeping someone’s attention. But an all-text flyer with 5 different fonts in 4 different font sizes doesn’t really count. One of the easiest ways to raise the bar in your ministry’s communications is to use stock photography and other graphics that are of professional quality. So illustrations, photography and other graphics is something I regularly try to use in all my communications. What most people don’t know is that there are great resources on the web that are either free or reallllllly cheap (like $1!). I’m constantly in search of decent royalty-free stock photography / graphics sites. Of course, some of the sites I use regularly aren’t explicitly Christian sites (like www.sxc.hu). I just love this week’s free Twitter Christian Backdrop download graphic. Take it and post it now to share in the joy! 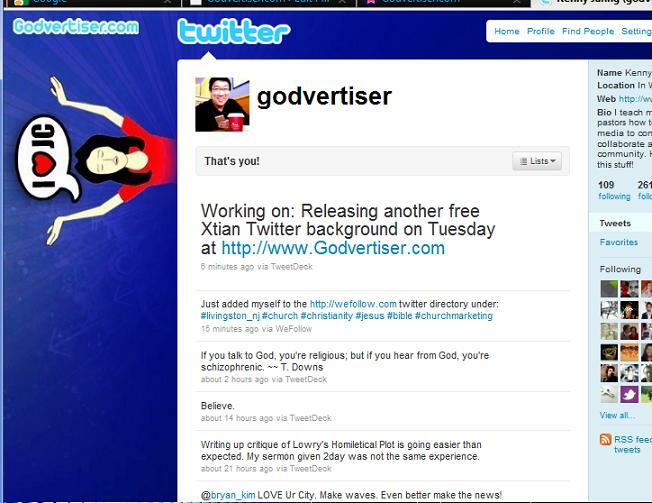 When the Free Christian Twitter Background Series started on Godvertiser (new free twitbacks available here on Tuesdays! ), I didn’t think it would be this much fun! I love J.C. And so should you! As in most other parts of life, Christians are embracing Twitter. 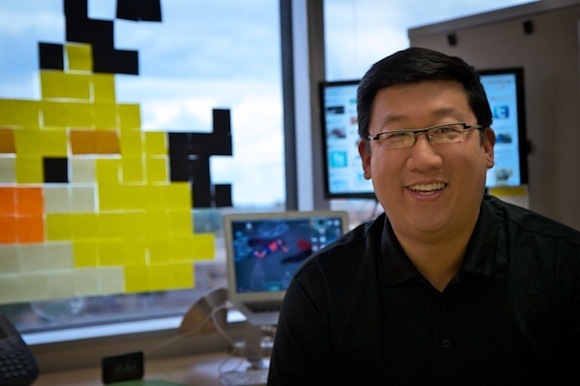 There are thousands of notable Christians using Twitter to wield their influence in the digital environment. Just as there are a plentitude of ways of expressing your faith in the offline world, Christian themed Twitter backgrounds is one of the ways some people are doing it online. Here’s our weekly dose of a free Christian Twitter Background from our free download series. Remember every week, we’re giving away a free Xtian Twitback design till the end of the year (if not beyond). Like this week’s Twitter graphic over the others we’ve released? Let us know in the comment section below. If you install this background, give us a link (use the http://www.twitter.com/kkcoolj full url so it will be a live link) to your Twitter profile so others can visit…and follow you. If have the design bug and want to contribute a Christian-themed background for Twitter brothers and sisters to use, please use the contact form and we’ll arrange to display + share your work with our brothers and sisters on the digital highway!